Coronation Park commemorates the coronation of Queen Elizabeth II in 1953. The coronation of Queen Elizabeth II as monarch of the United Kingdom, Canada, Australia, New Zealnad. Union of South Africa, Pakistan and Ceylon took place on 2 June 1953. Elizabeth ascended the thrones of these countries at age 25, upon the death of her father, King George VI, on 6 February 1952, and was proclaimed queen by her various privy and executive councils shortly afterwards. The coronation was delayed for more than a year because of the tradition that such a festival was inappropriate during the period of mourning that followed the death of the preceding sovereign. In the ceremony itself, at Westminster Abbey, Elizabeth swore an oath to uphold the laws of her nations and to govern the Church of England. Celebrations took place and a commemorative medal was issued throughout the Commonwealth realms. 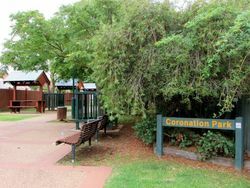 A widely representative public meeting convened by Gulgong Shire Council president (Cr. Leo Nott M.L.A.) and held on Thursday evening last made arrangements for the celebration of Coronation Day on June 2. 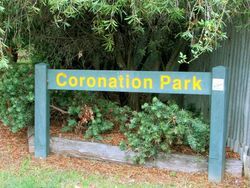 Mr. Moffitt moved that the celebrations take the form of a dedication of a new park in Mayne Street to be known as Coronation Park commencing at 3.30 p.m. on June 2, holes to be dug for a tree planting ceremony by old residents, addresses be given on the subject of the Coronation, the co-operation of the Town Band to be sought, the Band to lead a procession of children to a site for a Children's Outdoor Picnic (the new Convent playground recommended) commencing say at 5 p.m., a large bonfire to be lit and a display of fireworks to be given, the children to be provided with ice creams, chip potatoes and sweets; organised games to be arranged.